Finding Blake is delighted to welcome artist, musician, illustrator, songwriter and poet Salli Hipkiss, who has very generously offered a poem she wrote in 2017. 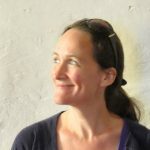 Modest Things brings her life-long love of William Blake to her growing concern with the problems of climate change and other environmental threats to human and other life. As with many children, I first encountered Blake when my primary school teacher read The Tyger aloud in class. I remember being awed by the vivid creature that formed clearly in my imagination, and also being a little shocked and thrilled by the mis-rhyme of “eye” and “symmetry” which hinted that the rules of language were far from set in stone. As an ‘A’ level English and Art student, Blake appeared again and I enjoyed responding visually, carving a mahogany dragon knotted around a wax rose inspired by The Sick Rose as part of my sculpture course. I feel I grew up with Blake. Since those beginnings I have continued to feel a strong kinship with the way he moves fluidly between vision, language, poetry, and advocacy — between eye and ear and mind and heart. I went on to gain a degree in Fine Art and Art History from Goldsmiths College and later an MA in Children’s Book Illustration from Cambridge School of Art. I have worked as an art teacher at home and internationally. I am also drawn to Blake’s sense of an innate justice, especially his railing against forces which rob people of their natural, creative life paths and individual flourishing, or nature of its natural expression and abundance: “A Robin Red breast in a Cage/ Puts all Heaven in a Rage”. And I delight in exploring the universal in his more mystical lines. The poem I am thrilled to be sharing here was written in March 2017 in response to my own musing — and attempt not to be despairing — about the magnitude of the environmental problems facing our planet today. Seeking intuitively to find an imaginative, inner mentor to help grapple with these issues I found myself asking the question: “What would William Blake have done?” I felt a pulse of excitement as I recognised this could be the first line of a poem and I crafted the rest of the poem from there. I am very happy to discover the Finding Blake website and her community of like minds and feel honoured to be asked to share my work here. Thank you. What would William Blake have done when faced with climate change? His pastoral demons never could have seen? Should we be kinder to our visionaries living now? The faltering beats – yes, hearts as well – as Evolution fails her prismatic wings? And oh how highly we value our Van Goghs now! If not comforted and contained by softer, closer loves. And pour into those earthen hands as many seeds and roots and worms as I can find. Tendrils climb and walls turn green with shiny hearts that hold a Wren. Must grow deep roots to balance them below. Salli Hipkiss ©1st March 2017. All rights reserved.